Hygger is a project management tool that allows various teams across the world to employ an agile approach as they handle their projects, whether such projects are related to software development, product development, or marketing campaign management. As an agile project management tool, Hygger helps companies and their teams strategically and quickly reach the goals of their projects and drive business growth and success by permitting them to create project plans, set goals and priorities, divide their projects into individual tasks, concentrate more on tasks that matter most, and enhance how they work and collaborate on their tasks. The tool enables users to implement project planning by which they will be able to easily formulate goals which they can measure and use for monitoring the progress of their projects. They can also create roadmaps so that team members can clearly visualize their goals and the steps, procedures, and tasks needed to reach those goals. 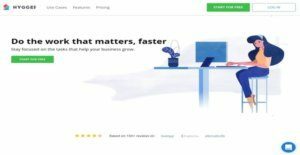 Hygger allows them to prioritize the things they need to do by applying any techniques, making it easy for them to identify and focus on the tasks that matter most and achieve their project goals quicker. Hygger makes sure that they are able to execute their plans successfully. With this tool, they can break their projects into individuals tasks, set milestones and deadlines, and assign tasks to team members. Hygger uses Kanban boards where teams can monitor how they are working on their projects and tasks, enabling team members to view what they should do, how long they must do it, and identify issues that prevent them from accomplishing their tasks faster. The project management tool improves the way teams work and collaborate on their projects and tasks by giving them easy access to all the information they need. The tool consolidates all communications, files, and checklists related to projects in one central place. Hygger helps you create workable plans by enabling you to quickly establish the specific yet very realistic goals you want to achieve. The software helps you measure these goals, allowing you to have a clear understanding of what you are aiming for so you can track your progress effectively and effortlessly. With Hygger, you can scale your goals down and create an actionable plan. Powerful road mapping tools make it easy for you and your team to visualize your projects and its phases. On top of that, you can utilize various techniques including the Eisenhower matrix to help you identify your priorities and focus on things that matter most so that you can achieve your goals faster. It is critical for every project team members to work efficiently and effectively as individuals and perform their tasks in cohesion and parallel with the rest of the group. Hygger helps you break down project plans into various tasks, distribute them evenly among team members, and ensure that each task is given to the highly qualified worker. The software utilizes a Kanban approach to track tasks and their status. This makes it easy for everyone to see where they stand, what needs to be done, and what issues are causing delays and bottlenecks. Hygger provides you and your team easy and instant access to tasks, schedules, communication tools, and priorities via a centralized platform. This creates a single, unified environment where everyone is connected to everything and each other, resulting in better communication and more productive collaboration. What Problems Will Hygger Solve? Each enterprise is different, and can call for a particular type of Project Management Software solution that will be designed for their company size, type of clients and staff and even individual niche they deal with. It's not wise to count on finding a perfect solution that will be suitable for every business no matter what their history is. It may be a good idea to read a few Hygger reviews first and even then you should pay attention to what the software is supposed to do for your business and your employees. Do you need an easy and intuitive service with only essential features? Will you actually use the advanced functionalities needed by pros and large enterprises? Are there any particular features that are especially useful for the industry you operate in? If you ask yourself these questions it will be much easier to locate a solid software that will fit your budget. How Much Does Hygger Cost? We realize that when you make a decision to buy Project Management Software it’s important not only to see how experts evaluate it in their reviews, but also to find out if the real people and companies that buy it are actually satisfied with the product. That’s why we’ve created our behavior-based Customer Satisfaction Algorithm™ that gathers customer reviews, comments and Hygger reviews across a wide range of social media sites. The data is then presented in an easy to digest form showing how many people had positive and negative experience with Hygger. With that information at hand you should be equipped to make an informed buying decision that you won’t regret. What are Hygger pricing details? What integrations are available for Hygger? If you need more information about Hygger or you simply have a question let us know what you need and we’ll forward your request directly to the vendor.